Multi-volume library of Russian literature to be published in the U.S. The Russian Library in English project will be released in print and electronic form, as well as a series of audiobooks. The most significant works in Russian literature will be published in the U.S. in a collection of 100 volumes. 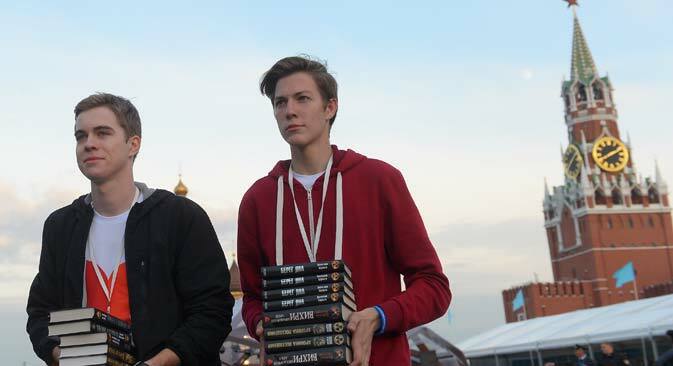 An agreement to that effect was signed on June 27 by the Institute of Translation and the U.S.-based Read Russia Inc. at the Books of Russia festival held in Moscow’s Red Square from June 25-28. Grigoryev went on to add that people that truly love Russian literature are not paying too much attention to the current political situation in the world and the obstacles it creates. “Literature is immune to sanctions, cultural exchange will continue and the creation of the ‘Russian Library’ is a big step in that direction,” Grigoryev said. For his part, Peter Kaufman, the coordinator of Read Russia Inc., pointed out that works by Russian authors are known and loved all over the world, therefore the creation of a full-fledged library of their translations had only been a question of time. The Russian Library in English project will be built chronologically and consist of landmark works, starting from the chronicle of Ancient Rus (an early Slavic state), to novels by contemporary authors. The editorial board has plans for a quarter of the library to be taken up by contemporary prose to give foreign readers the fullest possible picture of modern Russian literature. The list of works that will make up the library is being finalized. The selection is being made by the editorial board consisting of leading Russian and American experts in Russian literature. The most heated discussions take place around works by Zakhar Prilepin, Lyudmila Ulitskaya, Yury Buida, Evgeny Vodolazkin and other contemporary authors that represent modern Russian literature. The initiators of the project admit that without them the library would not be complete. “A foreign reader may find it easier to understand the mysterious Russian soul if they get a chance to get to know both Russian classics and modern literature,” said Executive Director of the Institute of Translation, Evgeny Reznichenko, who took part in the international editorial board session. The Russian Library in English project will be released in print and electronic form, as well as a series of audiobooks. It will feature an original design, while each literary text will be accompanied by a preface, background information on its author and the work itself, a bibliography of previous editions and translations, as well as notes to explain historical and other details.